Read what some of our happy clients have to say about Williams Gate Works. Would you like to leave your own testimonial? If so, please click here and drop us a line! 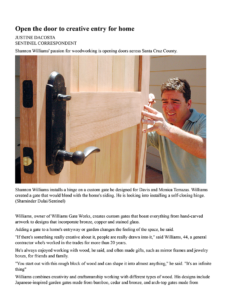 "I found Shannon Williams online"
I found Shannon Williams online searching for gates in Santa Cruz and the photos of his beautiful gates did not disappoint, in fact out-distanced my expectations. I appreciated that he was easy to work with in choosing the gate design and his workmanship and knowledge was superb. We were very satisfied with our selection of Shannon Williams as our contractor and would highly recommend. After months of planning, we recently began a total redo of our front yard. Part of this enormous project included replacing fences and gates. We contacted Shannon Williams and, after meeting with him and discussing various designs, decided to work with him on the gate replacement. The gates Shannon built for us are truly works of art and have become the crowning jewel of our yard redesign. His attention to detail is incredible and the end result is absolutely beautiful. We found Shannon to be very responsive, honest, and fair. His work is absolutely impeccable. We would recommend Shannon Williams without hesitation and look forward to working with him again in the future. "To complete our home's exterior"
To complete our home’s exterior, I searched via Google Images for the most beautiful wood gate in the world, hoping to replicate it. Unbelievably when I came upon the perfect gate it was built by a craftsman right here in Santa Cruz, Shannon Williams. I contacted Shannon and in just a few weeks he built and installed a gate that is absolute perfection! As a bonus he is easy to work with, great to work with actually, and I wouldn’t hesitate to recommend him to anyone, for any job. He has the skills, the taste, the eye to detail, a great work ethic, super communication – all the assets that make an ideal partner for any home beautification project. Williams Gate Works created a work of art for my property – better known as a ‘gate’. Furthermore, Shannon managed an architectural feat creating the gate, fence extensions, post systems and more making it look as if the gate was made with the original system. I love quality, I love art, I love our simple but beautiful gate – which opens and closes to perfection! Shannon is an artist whose medium is wood. I highly recommend him. Williams Gate Works recently completed installation of a driveway entrance gate to our property. I approached Shannon with some specific ideas for the look and general concept for the gate and immediate area. Shannon met with me on site and followed up with a written estimate. The gate was built with the highest craftsmanship and quality materials. It is exactly as expected, looks fantastic, and we couldn’t be happier. Shannon is the consummate professional and we highly recommend him if you are looking for quality craftsmanship. Shannon custom built us a beautiful gate. Not only was the quality top-notch but his responsiveness to my initial inquiry and follow-up visits were prompt and professional. So many contractors never even return calls — especially for smaller projects and jobs. Shannon not only called me back promptly but also came and did a site visit, went over all the options, and used his expertise to come up with a very elegant solution. I highly recommend Williams Gate Works. "His gates will attract admirers"
Shannon Williams just built and installed a second gate on our property. Now we have TWO of them! We couldn’t be happier with the quality of the construction, the beautiful materials, and obvious loving care with which they are designed and crafted. And Mr. Williams is very easy to work with — he really listens to you and you feel that customer satisfaction is a top priority. He is on time, clear in his communications, accurate in his cost estimates, and in all ways a very professional builder. It’s obvious that Shannon loves making beautiful gates. We give him our highest recommendation. BTW be prepared that his gates will attract admirers. They are standouts and do get noticed. the good fruits of his labor. Shannon removed our old wallpaper & paneling, redid our walls & ceiling, installed new cabinets, appliances, etc. We are happy with our “new” kitchen/dining area! We found Shanon to be honest, kind & also very fair in his pricing. We appreciated his correcting unsafe or incorrect conditions as he found them during the course of his work. Shannon responded to our questions & concerns promptly and we felt that he had our best interests at heart. We were very satisfied with our selection of Shannon Williams as our contractor. Mr. Williams was hired on to do a complete remodel of my home. I was very satisfied with work that was done and the time in which it was completed. Not only did Mr. Williams do a magnificent job on the remodeling but he did a Super Custom Gate Project for me which I absolutely love. I would recommend Mr. Williams to utmost closest friends. Click the thumbnail to launch the 3D flip-book. Article by Justine DaCosta of the Santa Cruz Sentinel.